Diablo's going to need a bigger army. Despite a rocky launch, it won't come as surprise to hear that Diablo III has sold like hotcakes since its release last week. Blizzard has officially announced the sale figures for Diablo III, revealing that it sold approximately 6.3 million copies of the action-RPG to date, nearly 3.5 million copies of which sold within the first 24 hours. "We're definitely thrilled that so many people around the world were excited to pick up their copy of Diablo III and jump in the moment it went live," said Blizzard co-founder Mike Morhaime, who went on to apologize for the server issues that marred Diablo III's launch day. "We also regret that our preparations were not enough to ensure everyone had a seamless experience when they did so," he continued. "I want to reaffirm our commitment to make sure the millions of Diablo III players out there have a great experience with the game moving forward, and I also want to thank them for their ongoing support. "Regarding today's announcement, we recognize that setting a new launch record is a big achievement. However, we're especially proud of the gameplay feedback we've received from players worldwide. 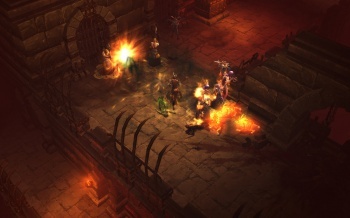 We're pleased that Diablo III has lived up to players' high expectations, and we're looking forward to welcoming more players into Sanctuary in the days ahead."